For many of us, the holidays are about spending time with loved ones, partaking in traditions old and new, and giving back to our neighbors and communities. To help you share the holiday spirit, we’ve created a list of four simple yet meaningful ways you can give back to others this season. Try one or all of them, and you’ll likely form new social connections or strengthen existing ones; as we discussed in our last blog, staying social is key to healthy aging. Doing a simple favor for someone can be such a meaningful gesture. Offer to babysit for a friend, family member or neighbor so they can enjoy a special evening together or simply have time to get their holiday shopping done. Pet sit for someone who will be traveling over the holidays. Grocery shop for a senior who can’t easily leave their house, or offer to help them prepare their holiday meal. These are just a few ideas, but don’t be afraid to get creative! A truly unexpected favor can be as simple as inviting someone to join you for your annual holiday gathering. While it’s a wonderful time of year for many of us, others may be without loved ones to celebrate with. If you know of someone in your circle of friends, neighborhood, at church or at work who doesn’t have loved ones nearby, ask about their holiday plans and if they don’t have any, consider inviting them to be a part of yours. If they’re hesitant to join, reassure them that you would be delighted by their presence and are happy to have the extra company. Should they still refuse, think of other ways to help them enjoy the season. Maybe they don’t feel comfortable attending your family’s holiday meal, but perhaps they would feel comfortable joining you for another holiday tradition. Local law enforcement, first responders and hospital staff will be working on holidays many of us have off. One way to thank these men and women for their service is by delivering baked goods and handwritten notes to their places of work. Don’t forget our troops, either. Another way to give back this holiday season is by donating your time. Volunteering has been shown to improve feelings of confidence and self-worth, and it’s a great way to socialize and build new connections. As an added bonus, it’s an activity your family and friends may be able to partake in as well. If you’re interested in volunteering as a group, start by calling local shelters, soup kitchens and food pantries, which are often in need of extra volunteers during the holiday season. If you’re looking to volunteer individually, consider using a resource such as VolunteerMatch.org to find an organization that fits well with your interests and skillsets. 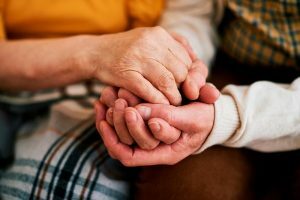 Older adults looking to give back can connect with the Retired and Senior Volunteer Program, which matches adults 55 and over with organizations in need of specific skillsets. These small gestures can go a long way toward making someone’s day just a bit brighter this season. They’re also a good reminder for what the holidays are all about — coming together, building community and spreading joy to others. At The Avenues Crofton Park, our residents love spreading holiday cheer through social events, sharing traditions and other community-building activities. Call 720-799-0915 or click here to schedule a tour of our community today.